Does your dirty vehicle have you down? Do your friends refer to your car as a piece of modern art? Is your exterior dull, dirty, and drab? No worries! This article is all about how to clean your car until it looks brand-spanking new. It’s no secret that one of the biggest automotive problems people face is keeping up with cleaning. It’s one of those common threads that keeps humanity connected, honestly. Y’know, like eating or drinking. Alright, so maybe that’s a little dramatic! It definitely is a common point of trouble for a lot of us, however. There are few people out there that have a firm hold on the ins and outs of getting their car up to par. Lucky them, right? For the rest of us it can seem like a mind-boggling problem with way too many solutions. While it’s great that there are so many different methods to try, there is very little time to pour research into the topic. This can make cleaning your car super overwhelming to even think about! You know that you really need to tackle the task. Naturally what you need now is a how-to guide on doing just that broken down into simple steps that keep you on-task, and ready to get the job done. That’s where we step in! Keeping a car clean does so much more than just give you a sense of peace. It also helps you keep the value of your vehicle even when you’ve had your car a long time. Doing your best to maintain a damage-free environment goes a long way in preserving trade-in cost, which is something to really consider! There’s nothing better than finding out that the money from selling your old car will more than cover your down payment. On the flipside, there’s nothing worse than finding out that your car is worth far less than it would be if you had taken some easy steps in keeping it clean! Thinking about it in financial terms can really put a new spin on the idea, and be helpful when you’re trying to find the time to set aside. After all, time is money, and there’s nothing like a cash incentive to get you to make the time you might not find otherwise. A clean car is also great for a clear mind. Think about it like this: wash off, wax on, worry free. Weird, but definitely true! You keep your house clean, your workspace spotless, and do your laundry weekly, so why not give your vehicle the same treatment? On the flip side If you struggle in those areas, that’s also great! We’re here to help you figure out the easiest way to get your car back in order while maintaining your sanity. Making sure you have a sterile environment for your commute, or even your daily errands can make all the difference. People, in general, feel more comfortable when they know their car is clean. Sitting next to a nice, shiny car in traffic can make your vehicle stick out like a sore thumb. It can look pretty sloppy! Every little thing counts. As another, smaller pro, you’ll never be afraid to give somebody a ride again without feeling embarrassed. With this one chore, you can clear your head, impress your friends, and up your resale value! What’s not to love? Keep reading to find out the ways in which you can bring your car back to its glory days! 1. Start Your Engines: … and figure out where you’re gonna get this done! If you don’t have access to a large area where you live you might need to find somewhere for the job. This is also true if you don’t have a spigot and hose, both of which make this infinitely easier. You can substitute a bucket, but there are tons of places to go that have ready water access! This can be a car wash, for example. 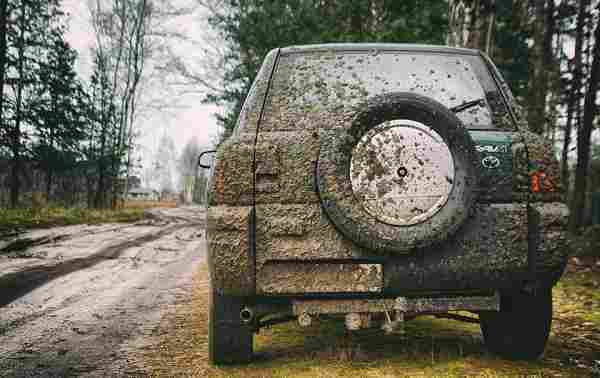 While it may seem like an easy out we really don’t suggest going through a car wash, by the way. It can cause damage to your car and doesn’t really get a thorough clean on the details. Doing it by hand is the best way, and it’s quick enough to be worth it. Carwashes normally, however, have side areas where you can wash your car yourself. They provide an extra-long hose that can reach even the roof of your car. They normally cost about .25 cents for a small window of time, so they’re very affordable. Hey, you can even use the change you find from your interior cleaning! 2. Gather Your Supplies: This might seem like a silly step to mention, but it’s actually super important to think about. You want to make sure that you have the right supplies for the job in order to do a thorough job. Make sure that the products you are using will be the right fit, such as finding cleaners that won’t be harsh on your car, or might be professionally formulated. Pay attention to scent, too. Some people have a hard time dealing with strong smells since they will annoy a person at best, and cause migraines at worst. Be sure to give the cleaner a small sniff, and decide on a scent you won’t mind getting a large whiff of! When you’re elbows deep in sudsy water that fragrance will be way stronger. 3. 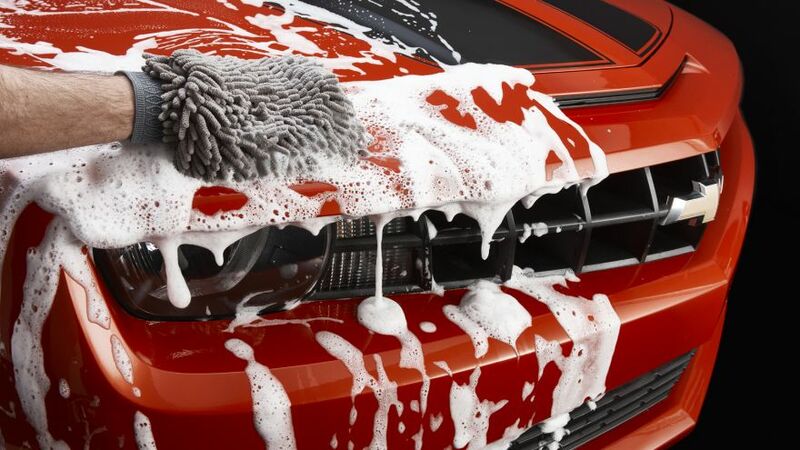 Splish, Splash: Finally, give your car a nice ol’ bath! You’re going to do this in a pretty smooth process. First, make sure you have your source of water. This could be a water bucket, a hose, or a system at a self-serve car wash. If you have a hose or spraying system then wash your car off briskly first. This will help get rid of loose dirt and other materials that could damage your paint. Now you can add soap to the mix. We suggest using a bucket for this and filling it with water. If you’re using the bucket method, you already have one ready! Add soap to the water for a quick cleaning solution. After this, you can dip in a sponge and gently wash your exterior. Direct, straight lines are the best motion to make for your paint and will avoid leaving smears behind. Make sure to get it nice and frothy with lots of suds to go around. We recommend actually beginning with the rims, however. These will require the most amount of effort to clean since they’re generally pretty dirty. We recommend pre-treating any stuck-on material before beginning the rims. This will give it time to soak in and break down bugs, sap, or whatever else might be stuck on. Now that you’ve done that, give those rims a good spray down if you can. Make sure all of the debris is gone, and you get all the tight areas thoroughly. You’re ready to soap up your car! Use a cleaning mitt or microfiber towel to do this, and make sure to pay attention to those areas that were pre-treated. They might need more TLC than the rest! Wash one side, rinse it off, and then repeat this process on the other side. The last step is to dry your car off, which is crucial! A squeegee and microfiber towel combo works like a charm. Use the squeegee to get rid of the excess water, and then gently wipe down the car with the towel to finish it off. Presto! It’s as simple as that. You’re now ready to get your products together and get started. After-care products are optional, but they can take your car a step above. There are also products specifically formulated to keep your car clean for longer. Protective coatings of any sort are always a great idea! – Bring two buckets if that’s the method you’re using. One of them is for soapy water, and the other is for clean water. You’ll probably need two buckets, but it’s nice to have one ready to go. 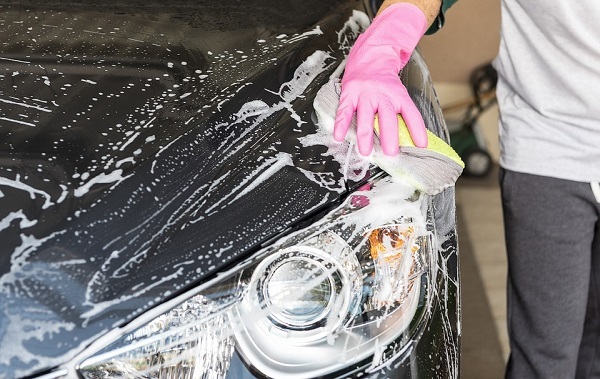 Don’t try to substitute car-specific soap for dish soap. It’s pretty common for people to think it would work since it removes grease and grime effectively. However, it does this by being abrasive. it’s bad for your paint! Wear clothing you don’t mind getting wet. Heck, this could even be your bathing suit! You’re probably going to get pretty wet during this process so keep that in mind. Take into account your surroundings. Your neighbors probably wouldn’t appreciate a flooded driveway, so make sure you aren’t going to leave behind a ton of water. Note where your driveway or street slopes since this is where water will flow to naturally. If you think it’ll be a problem then find somewhere with flat ground, or even do it in your yard where the water will absorb into the ground. Make sure you empty and refill your water as much as you need to as the water gets dirty. Dirty water will track right back to your vehicle and make a mess. Don’t be afraid to use some products from your pantry! While dish soap is all around a bad idea there are some things you have laying around that will work in a pinch. For example, hair conditioner is great for shine. 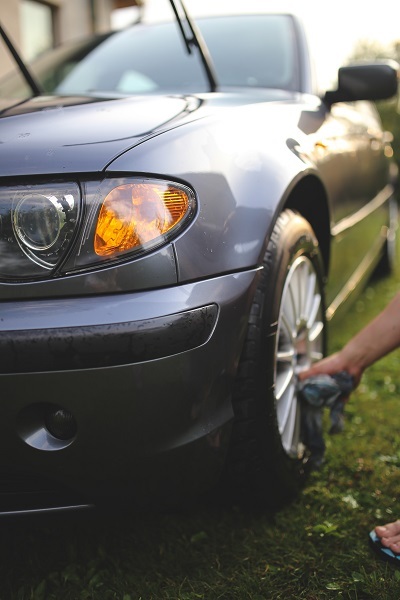 You can use glass cleaner on your headlights for a brighter shine which enhances your safety. There are a lot of different ones to try! Just make sure they’re backed by credible sources, and be wary of those that don’t come with a video how-to! The video ensures you can see it work in real time and judge it for yourself. You probably won’t have time to do a comprehensive cleaning every week even if you’d like to. It’s because of this that spot-cleaning once a week is super important for those who can’t make time weekly! This will make your life easier in the long run, too, since it’ll cut down on the grime that builds up between washes. 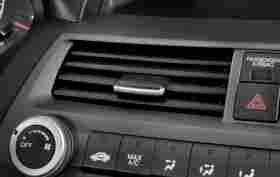 This is a much shorter list and is more just some ideas on how to keep your car generally clean. 1. Focus on large problems as you find them. You can pre-treat a spot on your car before you start yard work, for example, and then halfway through go back to try and wash it off. 2. Your rims could also use between-wash love. Since they get the dirtiest it can really improve your vehicle’s appearance to give them a quick wipe when you have time. 3. Headlights pose a huge safety risk if they’re dull. When you have build-up on your headlights just wipe them down with some glass cleaner to get them back in fighting form. You’ll be amazed at the difference it makes for night time drives! 4. The last item is your windshield and other mirrors. These are the single most important parts of your car for ensuring safety. If you keep these crystal clear you also clear up your line of sight. Stay safe, and make sure you wipe them down with glass cleaner periodically.